Why should it all be so complicated? I mean, so very complicated! Why should this whole process be so painful and challenging at all levels? Why should every cell and tissue within me croak with pain? Why should I be required to solve such a puzzling ambiguity and dilemma? Why should I be mindful and attentive all the time to obtain the answers I need? Why should I be going through such an emotional roller-coaster ride when no living force in the Universe cares to respond to me? Why all this? What am I in anticipation of? It is often said, especially while emphasising the greatness/selflessness of a mother, that the process of delivering a child is the most painful thing. And also that, despite going through all this, a woman doesn't hesitate to embrace motherhood again! I don't know about this pain as I haven't experienced it myself, but I assume a woman has her triggers to embrace such pain - be it the bliss of love from her partner, be it the sense of pride, responsibility and liberty motherhood bestows, be it how motherhood fulfils womanhood, be it the love she wants to give and take from her children, be it adhering to societal norms, or be it nature just being at its work to procreate and carry the creation further and the woman just surrendering to the nature's wand...all without her individual call. Now, what is it that which merits this excruciating pain I am undergoing? And it's not a one-time pain, it doesn't end in few hours. It doesn't end even within nine months. I don't even know when this is going to end. If some God in the form of an enlightened person comes along and at least says - "Look! This is going to end after two years", I'll be happy. Ten years? Even then I might be ok. But this whole uncertainty of when this is going to end, is making this process all the more painful. So, all that thought process was yesterday. It happened yesterday! Like, I was crying, "Come on! Somebody say something! Damn you, God and Goddess! You can't be so ruthless! So unkind! You make me aware that you are there, through the pain that you give me everyday, through the wisdom you give me at times, yet you behave as if you don't exist! I don't even have the comfort of assuming that this world is Godless. At least then, I could take a call. I would not wait for anything then. I would either die or surrender to the whole thing and be paralysed or resist this whole thing and take some medicines this Science offers, for a temporary relief at least, if not as a long term solution. I'm not able to kill myself anyway, but if I allow them to, this void and negative energy spiralling within at least can give me a brain stroke, so I can die later. But this awareness you gave me would not let me do that. You made me know that all this can be processed! All this process, all this pain, all this waiting, does not make any sense anymore. Yet, I remember the sense it once made and that's the whole problem!" "This waiting for 'something' to happen, is tiring me. And what can be more painful than waiting for something, when you don't know what that 'something' is, except that you definitely know that 'that something' has not happened yet. I wish I be ignorant of all the awareness I gained. What should I be doing with this awareness? What the hell should I be using this 'awareness' for? I'm all agitated with people, I don't even behave peacefully with people to claim that I'm on a spiritual path and that I'm being enlightened. There are a certain set of parameters this world uses to measure spirituality. And I don't measure up to them. I can't live, I can't die. There is hope, there is no hope. How long should I live this paradox? Nobody understands this. Explaining it to people only aggravates the problem. There's no solace. At least you would not even make people around me function favourably. It's like my energy field is always at loggerheads with the energy fields of people around. I'd like to state it is the vice versa, but let me take the current world as the standard way to conform to! There's got to be a limit for this endurance. There's got to be a limit. And where does all this endurance come from? The more the pain, the more the endurance. I wish this process makes people less enduring...actually debilitate them, so they could collapse! But no, it doesn't! There's got to be a limit God! There's got to be a limit!" So, as was I weeping like this, the Universe did, kind of, answer me. Oh no! Don't assume, it answered me clearly...like somebody saying something as an answer to all this...or some idea popping up from an external source...No nothing like that. I was tired of weeping and was checking the Pinterest pins and one pin clicked well with this situation, so I (had to) assume it's an answer. Now, as I told you in one of my previous posts,I've not been experiencing much synchronicity for the past two years and this was how Universe had been answering me. It answers very vaguely and that certainty I experienced before, during 2012-2014, isn't there anymore! Yet, I need to agree that the certainty that was sowed deep inside me was enough to pursue this path. I really did not need to experience it continuously. Ok, let's come to that Pinterest pin which served as an answer to this storm inside me. I was like, "Ah come on! I needed this. And to top it, this idea pops up from this guy*!?I?! The rift is not with Tyson here now, it's with the Universe/God or whatever damn power this is! Universe! If you are NOT under any obligation to make sense to me, then why the hell am I under any obligation to be part of you? I would have earlier asked, 'Why am I under any obligation to serve you?' But I don't feel that way anymore. Maybe I'm not serving you by doing all this. Maybe, I'm doing all this for my own self. It's just that I am unable to figure it out. What is that damn thing I'm doing all this for? What is it that merits this huge chaos inside me? I would not do this for anything or anybody, not for any damn twin flame I might have once loved, not even for myself! I would not do this for any bliss I HAD GOT or I MIGHT GET in the future. I would not do this for the God and Goddess - the Cosmic Parents, I would not do this for my Cosmic Family, I would not do this for the family here. I would not do this for saving this world, which doesn't give a damn to my pain and to whose well-being I don't care a damn! If I had to do this for myself, then I don't need myself. I'd better die. So why is it that you still keep me in this grave?" So, that was all the debate that happened (no it wasn't the mind chatter, it's almost like involuntarily shouting at the Universe), but the truth is that I had already come to acceptance long ago. I had already accepted this fact that, if need be, I might have to be in this situation, till the end of this life time. This storm happened many times before and that's what led to such an acceptance. So even as the storm was raging inside me, there was a faint voice from deep within mocking me - "Come on! Don't act. You getting emotional this way for the n'th time looks funny. You already accepted it, so why make huge fuss about all this?" Infact, it is this very paradox of 'pain- ok with pain' that tired me the most. So, why did I come to that acceptance, one might ask. Even I don't know. But when I reached that stage of acceptance, I had this certainty that my soul would have taken up this responsibility before I was born here. Maybe, my human self is unable to grasp the reasons behind why the decision to endure this pain was made, but I was certain my higher self wanted to do this. Maybe, this human self of mine does not want to endure all this for anybody/anything on the long list listed before, but maybe my higher self does want to do it for any of those things. It is this respect that I have for the existence of a higher self, it is this understanding that the priorities of my higher self should precede those of my human self, is what keeps me going. So, to this day, I don't seriously question this peace I made with myself...such weeping sessions happen on and off, though. I just wanted to give readers a glimpse of it, as I feel that I'm nearing the end of this phase. If I don't experience the pain again, there is no way I could recall any part of how it felt, except the sole thing that it was dreadfully painful. So this post is for my records** at least, if not for anybody else. It's like being kept in the field that exists between two huge repelling magnets and passing electricity through that space. It's like being caged in that field and moving in this world with that cage in tact. Sometimes, it felt like I'm carrying a black hole in the form of a double vortex dark matter field...A moving black hole, I had myself become...Non-existence within existence, that is! A black hole, which might any time transform into an atom bomb. The being inside me, whatever living force remained of me, silently wept yesterday - "Somebody please dispose this off from inside me! Please!" 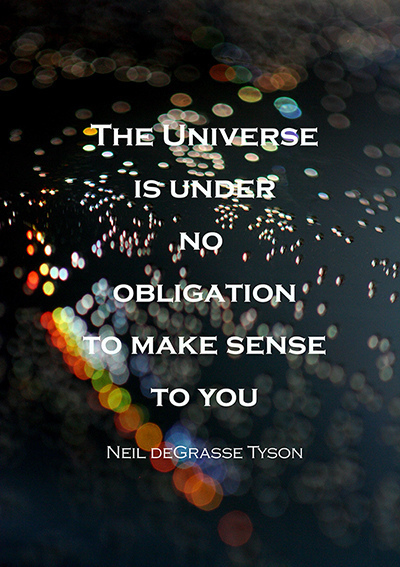 *When I first saw Tyson in the first episode of "Cosmos: A Space Time Odyssey", I found his talk very repulsive. I felt, he presented common generic ideas about the Universe as though he was dishing out viewers some rare wisdom with such an air of confidence as though he had firm grasp of the Universe. I had felt that a series like that is such a rare and excellent opportunity which is bound to inspire humility in the speaker presenting it. His ideas, his presentation, his body language...I don't know, I can't pinpoint one, but I found the whole presentation made by him very repulsive. Recently, I was glad to find out that somebody out there in this world resonates with my ideas about Neil deGrasse. But contrary to what I felt about him in the first episode, it seems Neil deGrasse loses sleep wondering if we are intelligent enough to figure out the Universe. Poor guy, looks like he is burdened by his own journey about space talk so far! It must have been in one of those melancholic moments during his sleep, that such a profound statement sprung from him! It seems he thinks: "...It's not that we are better than the universe, we are part of the universe. We are in the universe and the universe is in us." 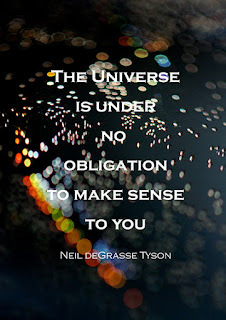 Awesome Neil deGrasse! Great ideas! Interesting, you even consider the possibility if we are better than the Universe! I'm sorry, looks like I totally misread you from that one single episode! **I'm pretty selfish of course, who isn't...everything I write here, every song I keep braying on my blog, it's all purely for myself. It's to ease out my pain, to keep my sanity, to obtain more knowledge in this journey - basically to know more and expand my awareness...ultimately to further the purpose of my higher self, whatever that is - good or bad!